Pyrus toringo.Copyright Henriette Kress.www.henriettesherbal.com (Accessed 5/2015). Pyrus sieboldii is a shrub with spreading branches, twigs hairy. Leaves alternate, stalks hairy, 0.6-1.8 cm long, egg-shaped to elliptic, 2.5-6 cm long, leaves of shoots 3-5 lobed, tip long-pointed, margin sharply toothed, young leaves hairy on both sides. Flowers pink in bud becoming white, about 2 cm wide, calyx hairy, stalks about 2 cm, hairy. Fruit fleshy, over cartilaginous, seedy core, red to yellow-brown, rounded, 0.6-0.8 cm, calyx deciduous, fruit persistent into winter. Origin: Japan, Korea. Mostly horticultural, planted in parks, may occasionally escape, soil pH 5.3-7.5 (USDA, NRCS 2010). Notes: Many hybrids and cultivars so may vary from above. 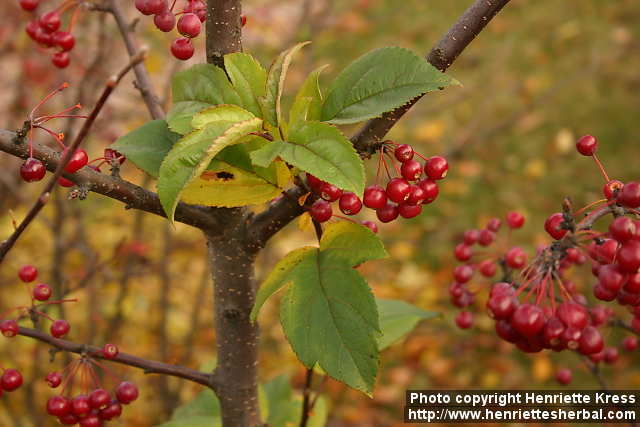 Listed as Malus s. in ITIS data (2012) and in flora of China (Wu and Raven 2012).